We see what happened between Mickie James and Alexa Bliss last week. Mickie is walking backstage and comes up on Alicia Fox, who says no one was listening to what she said about Bliss last week. She sees Emma next. Emma says even at Mickie’s age, she still has a secret admirer as someone left her a surprise in the dressing room. Mickie enters and there is a box of Depends left as a gift. Mickie isn’t happy. She walks out and asks Fox & Emma if they think that’s funny. She asks where Bliss is and they point her to her locker room. Mickie beats on the door but Nia Jax opens. Mickie says she wants Bliss but Nia says that’s not happening. Bliss offers Nia for a match with Mickie. Nia smirks and looks confident and the match is made as Mickie walks off. We go to the ring and out comes Nia Jax. Mickie James is out next. The music interrupts before the bell as RAW Women’s Champion Alexa Bliss comes out to watch the match from ringside. The bell rings and Mickie turns back around to Nia running her over. Nia tosses Mickie across the ring. Mickie tries to fight back but Nia beats her down and tosses her across the ring again. Nia uses the middle rope on Mickie as the referee warns her. Nia keeps it up as Bliss laughs at Mickie. Nia scoops Mickie for a bear hug now. Mickie fights out and attacks but Nia drops her. Nia keeps Mickie down with a knee to the back side now. Mickie looks to make another comeback with strikes but Nia headbutts her down. Nia tosses Mickie out of the ring. Bliss mocks Mickie and Nia stands tall in the ring as we go back to commercial. Back from the break and Mickie is making a comeback but Nia cuts her off again and takes control. Nia taunts Mickie and takes her time with her now. Mickie unloads with strikes and kicks against the ropes now. Nia comes right back and tackles Mickie. Nia is slow to cover Mickie for a 2 count. Nia keeps Mickie grounded on the mat now. Mickie fights up and out but Nia applies another bear hug as Bliss looks on. Mickie fights back with elbows but Nia drops her once again. Nia goes for a powerbomb but Mickie slides out. Mickie with another attempt at a comeback now. Mickie goes for the legs and brings Nia down to one knee. Nia ends up ramming Mickie back into the corner. Nia places Mickie on top but Mickie boots her and fights back. Mickie nails the tornado DDT off the top and covers for a pin but Bliss runs in and attacks her for the disqualification. After the bell, Bliss keeps up the attack and sends Mickie out of the ring. Bliss briefly checks on Nia before going out to the floor to attack Mickie again. Mickie counters and drops Bliss with a kick. Mickie taunts Bliss as her music hits. Nia is standing on her feet in the ring now. Mickie talks some more trash as Nia looks on. Back from the break and WWE Ambassador Dana Warrior is in the ring with breast cancer survivors, Emma, Alicia Fox, Sasha Banks, Dana Brooke, Bayley, Mickie James, Nia Jax and RAW Women’s Champion Alexa Bliss. Dana talks about her husband, WWE Hall of Famer Ultimate Warrior, and how strong these survivors are. She then presents them with custom women’s title belts that are pink. Warrior’s music hits and the survivors shake the ropes with Dana. The Superstars greet them as the music continues and the segment ends. 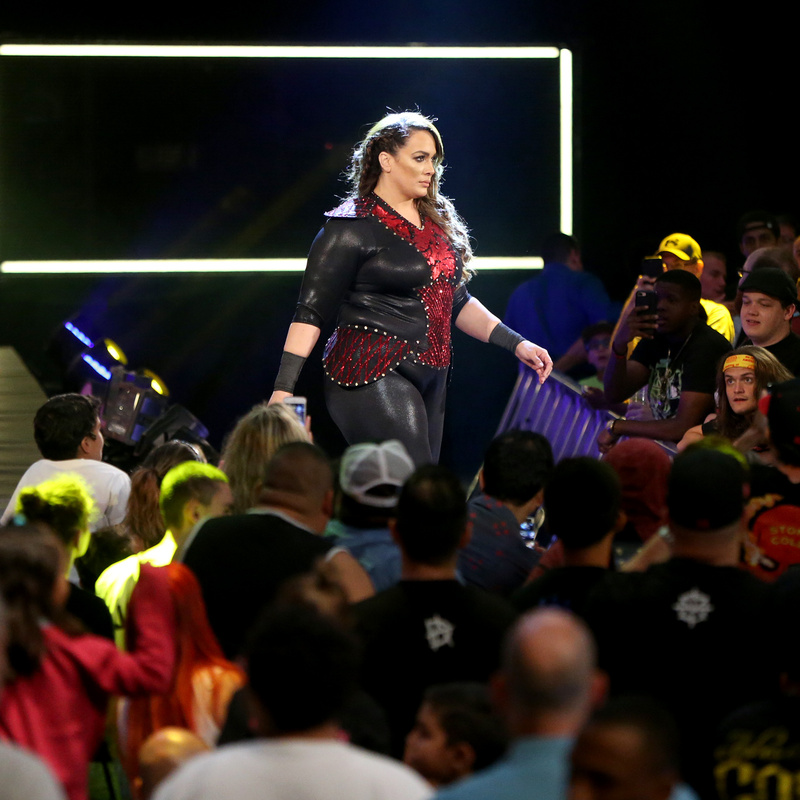 Back to the ring and out comes Nia Jax. We go to commercial. Back from the break and Emma waits with Nia while Sasha Banks makes her entrance. Bayley is out next, stopping to hug two young female fans sitting near the stage. Nia starts off with Bayley and mocks her over her shoulder. Bayley attacks first but Nia cuts her off and splashes her in the corner. Nia scoops Bayley for a Samoan Drop but Sasha runs in to make the save. Nia ends up sending both opponents down on the floor. She taunts them and stands tall in the ring as we go to commercial. Back from the break and Emma has control of Bayley. Bayley tries to fight back but in comes Nia to keep her down. Nia works Bayley around and drives her hard into the mat on the injured shoulder at one point. Bayley finally gets the hot tag when Emma is in. Sasha unloads on Emma and hits a dropkick. Sasha with a cheap shot to Nia before hitting double knees on Emma in the corner. Sasha with a 2 count on Emma as Nia breaks the pin. Bayley comes over but Nia sends her out to the floor. Banks kicks Nia to the floor. Bayley leaps out onto Nia but she catches her in mid-air. This leads to Bayley shoving Nia into the ring post. Sasha comes back into the ring but Emma rolls her up for a close 2 count. Bayley tags herself in as Sasha floors Emma with a knee. Bayley goes to the top and comes down for a Bayley-to-Belly on Emma for the pin as Nia looks on. We see Nia Jax and RAW Women’s Champion Alexa Bliss backstage walking. We go to commercial. We go to the ring and out comes RAW Women’s Champion Alexa Bliss for this non-title match. Nia Jax is out next. The bell rings and Bliss stalls by dodging Nia. She goes to the floor and Nia tells her to bring it back in. She comes back in and goes for a hip lock but Nia slings her across the ring, back out to the floor. The referee counts and Nia tells Bliss to get back in the ring. Bliss comes back in and hides behind the referee but Nia grabs her. Nia lifts Bliss high by the arm and holds her but Bliss breaks free with a knee. Bliss tries to run away but Nia grabs her. Bliss slaps Nia and run towards the ramp. Bliss tries to leave but the music interrupts and out comes Sasha Banks. Bliss runs back towards the ring but she runs into Nia and hits the floor. Nia stands over Bliss at ringside as we go back to commercial. Back from the break and Nia is in control. Bliss turns it around and Nia hits hard in the corner post. Bliss steps on Nia’s back and goes to the top for a crossbody but Nia catches her mid-air and hits a Samoan Drop for the win. After the match, Sasha hits the ring and jumps on Jax’s back but Nia slams her to the mat. Nia stands tall until Bayley’s music hits and out she comes. Nia signals Bayley to bring it but she just looks on from ringside. Bayley steps up on the apron and enters the ring, standing with Bliss and Banks. They take Nia out and send her to the floor. Nia leaves as the other three look on from the ring. Alexa is at commentary before the match start. Sasha and Emma got at it before taking each other down at the same time. Nia’s music hit and outcomes Nia. She stare down the laid out Emma and Sasha before heading over to join commentary. 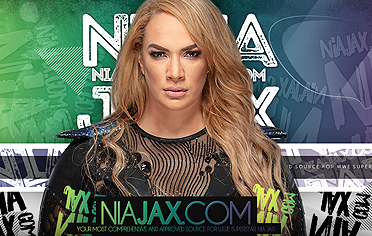 Nia talks her relationship with Alexa and how she plans to beat everyone at No Mercy to become champion. Sasha goes on to defeat Emma to end the match. 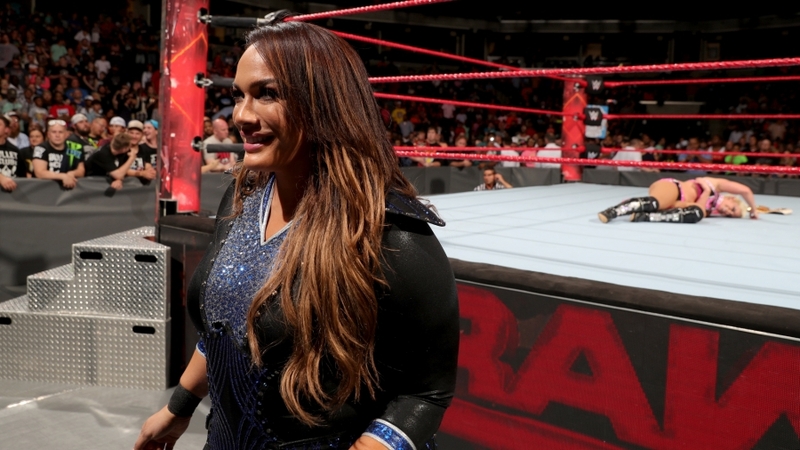 Nia Jax walks in on RAW General Manager Kurt Angle backstage. She wonders how Sasha is getting a title shot before her. Kurt says it’s Sasha’s contractually obligated title shot. She goes on to say she deserves a opportunity at No Mercy when Emma walks in. She says according to Twitter, people were talking about her last week, not Nia. Emma has a new hashtag this week #GiveEmmaAChanceAtTheWomensTitle. Nia threatens Emma and Angle shuts them up. He makes a tag match for tonight. If Emma and Jax win, they will be put into the title match at No Mercy to make it a Fatal 4 Way. After the match, Nia and Emma stand tall as we get replays. Emma looks to extend her hand but Nia ends up dropping her and leaving her laying with a Samoan Drop. RAW Women’s Championship Match: Alexa Bliss defeated Sasha Banks to become the new women’s champion. After the match, Bliss celebrates as Nia Jax comes out to join her in the ring. Nia splash Sasha in the corner. Nia lifts Bliss on her shoulders to celebrate but drops her into a fall away slam out of nowhere. Nia raises the title and stands tall over Bliss as we get a replay. Nia makes her exit as her music plays and Bliss is laid out on the mat. RAW goes off the air with Jax staring back at Bliss in the ring. Emma is backstage with Dana Brooke and she’s tired of hearing about Sasha. She rants and says to watch what she does to Nia Jax in their match tonight. Nia appears behind Emma now. Emma goes on dissing Nia until she sees her and asks how long she’s been standing there. Nia says the new hashtag after tonight will be “#GiveEmmaCPR.” Nia walks off and we go to commercial. 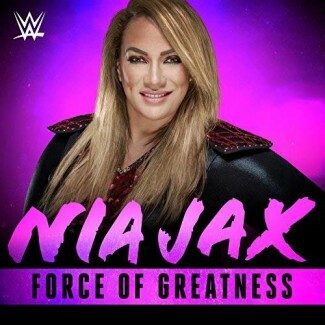 Back from the break and out first comes Nia Jax. Emma is out next. The bell rings and Emma is on the immediate attack on Nia. Nia floors her and drops elbows. Nia sends Emma to the corner and splashes her, sending her to the mat. Jax goes for another running splash but Emma moves out of the way. Emma with a dropkick. Nia catches Emma in mid-air and drops her with the Samoan Drop for the win. After the match, Nia stands tall over Emma as her music hits.